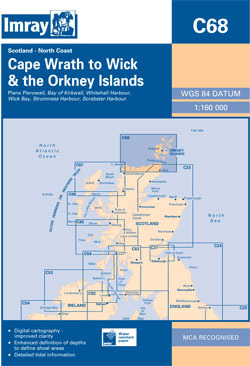 The north coast of Scotland from Cape Wrath to Wick, including the Pentland Firth and the Orkney Is. Scale: 1 : 162.000. One-minute gridlines. Larger scale plans of Pierowall, Kirkwall, Whitehall Harbour, Wick Bay, Stromness and Scrabster. 2013 EDITION - Fully updated throughout using depths from the latest known surveys, specifically at Kirkwall Bay, Scrabster Harbour, Wick Bay, Stromness Harbour and in deep-water areas across the main chart. The marina at Wick is now shown, as well as recent harbour developments at Scrabster.